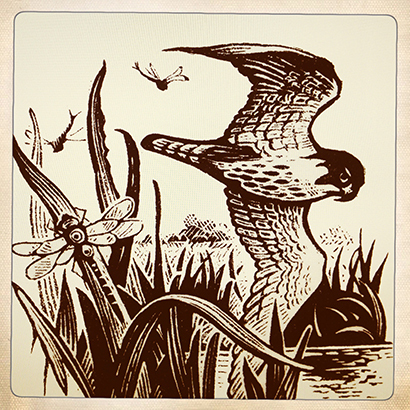 As the mayfly clouds billow, particularly across the southern streams, and the swallows and martins fill their beaks, the sharper eyed angler might notice a larger bird swooping among them. The hobby (Falco subbuteo) is our most graceful falcon. It winters in Africa and follows the hirundine migration north, and over the last half century has expanded its British range from a handful of pairs on the southern heaths to a few thousand that nest well into Scotland. In spring, they feed mainly on insects, carving through the air on long scythe like wings before passing prey directly from talon to beak. They are masters of the air, and look smart with their moustachioed face and bright red trousers. In a time when so many bird species are dwindling, we can cherish this flash of grey that isn’t.